Australia’s southern island state is a place of incredible beauty and its compact size makes it the perfect place for a good old fashioned road trip. Zoom along winding country roads through thick eucalypt forests where a sweet piney scent hangs in the air. Take an afternoon stroll down a wide swathe of powdery white sand lapped by turquoise seas that would look very much at home in the Caribbean. Hike through rugged landscapes and fairytale forests in search of spectacular mountain views. Or simply indulge in the many fantastic wineries and restaurants where virtually every dish is crafted from locally grown ingredients. Whether it’s your first time down under or you’re an Aussie local, Tasmania has so much to offer and beautifully combines some of Australia’s best nature, best beaches and a charming snapshot of rural life. Planning your trip? Here’s my complete 10-day Tasmania road trip itinerary that takes in some of the most beautiful spots this island has to offer. We flew into Launceston on an early morning flight and hit the ground running, picking up our rental car at the airport and beginning the slow meandering drive towards Tasmania’s spectacular east coast. If you’re arriving in the afternoon, it’s probably best to spend the evening in Launceston and kick off the road trip the following day instead as there’s plenty to see along the way. Setting off, we were immediately thrust into the Tasmanian countryside, weaving between eucalypt forests and yellowing pastures on a narrow country road. We made a beeline for Lilydale Falls, stopping off at the small minimarket in town for supplies, though in hindsight, visiting one of the larger supermarkets in Launceston would have been a better idea. The shaded tables made a lovely spot for a picnic lunch before setting off on the 10-minute walk towards the small cascades. Next up was the much-anticipated sprawling lilac fields of Bridestowe Lavender Estate which, as our luck would have it, were at their fullest bloom and ripe for the summer harvest. Frolicking through the blossoming lavender fields had long held a place on my bucket list; breathing in the heady floral aroma and watching the bees whizz about in a frenzy. Little did I know that dream would eventually be realised here in Tasmania rather than in the south of France. The peak flowering season is very short lasting from December to February at which point the harvest transforms the purple fields into neat rows of green. For prime lavender viewing, mid-December to mid-January is the ideal time to visit. During this peak period, entry to the estate is $10 (it’s free at other times of the year) which includes a free guided tour that traces the estate’s origins, the harvest and the distillation process. If you’re not visiting during the flowering season, however, I’d perhaps suggest skipping this stop. After a slow ramble through the brightly coloured fields, stopping for plenty of pictures and sampling the very generous servings of lavender infused ice-cream on offer, it was time to hit the road again. Next up was Pyengana Dairy Company for an afternoon caffeine hit and to sample their award-winning cheeses, before setting a course for the Bay of Fires. Following an early seafood dinner beside the marina, we headed off to explore the bay beneath the radiant glow of the setting sun. Though many visitors assume this pretty piece of coastline gets its name from the vermillion streaks of lichen that encircle many of the boulders in the area, in fact, it originated in the 1700s when a passing ship noticed the plumes of smoke along the coast from the fires of the land’s indigenous communities. Our first stop at Binalong Bay and the Skeleton Bay Reserve led us to some sublime beaches which we vowed to return to the following morning, followed by a drive up Gardens Road which passes through thick eucalypt forests that offer up brilliant glimpses of the rugged coastline. Pulling into one of the many parking bays, we found a perfect spot for a sunset drink to watch the rough turquoise seas, our feet buried in the powdery white sand and the fading glow warming our backs. If you’re skipping over the lavender fields, you’ll have plenty more time to explore the beautiful coves and coloured rocks of Binalong Bay, and if the sun is shining, a refreshing dip is certainly a good idea. If you’re travelling by van or with a tent, there are a number of basic but perfectly situated and completely free beachside camping spots along Gardens Road. See here for the official campgrounds and available facilities. Otherwise, St Helens, set just 12 km from Binalong Bay, makes an ideal base for exploring the area. Check rates and availability here. Waking to a glare of brilliant sunshine, we decided to change up our plans and return to Binalong Bay to spend the glorious morning paddling in the cool blue water, lazing on the sand and clambering over the rocks before setting off along the beautiful coastal road towards Coles Bay that, as we quickly discovered, would provide many more opportunities for spontaneous swims throughout the day. There are a number of scenic viewpoints points as you make your way along the coast, but it was the view coming into lovely little Bicheno that had us all glued to the window, oohing and aahing as a wide isthmus of white sand lapped by clear turquoise waves sprung into view. There was no deliberation needed here – this would make the perfect stop for lunch. After whiling away a few hours, eating lunch on the sand, walking the wide arch of Redbill Beach, traversing the narrow sandy strip toward Diamond Island Nature Reserve, taking a thoroughly refreshing dip at Waubs Beach and stopping for a look at the Bicheno Blowhole, we pushed on towards Coles Bay and our very first glimpse of the Freycinet Peninsula. Be sure to catch the sun setting over the famous Hazards when the knobbly hills burn a deep orange as the sun dips below the horizon. Some of the best viewing spots are the waterfront of Coles Bay, the far end of Muirs Beach or from the rock platforms surrounding the Edge of The Bay Resort. There’s not a great deal of budget-friendly accommodation around Freycinet National Park, but you’ll find plenty of luxury waterside lodges in the park itself, or a selection of lovely self-contained homes in Coles Bay, just a 10-minute drive from the park entrance. Otherwise, many people also opt to stay at Swansea instead which is about an hour’s drive away. The Blue Shack | As a group of 4, this spacious 3-bedroom home made the perfect base for a few days at Freycinet National Park. The kitchen was huge and well-equipped, it’s walking distance to town and the waterfront, and the lounge area was super comfortable for kicking back after a long day of hiking. Check rates and availability here. Freycinet Lodge | Set inside Freycinet National Park, this 4-star lodge receives excellent reviews online and boasts modern rooms amidst the eucalypt forests, nearby beach access and buffet breakfast included. Check rates and availability here. Otherwise, you can search the full range of Coles Bay and Swansea accommodation here. Today meant ditching the car and exploring Freycinet National Park on foot. Try to arrive early to beat the crowds and remember to pay the national park entry fee at the Visitor Centre before leaving your vehicle in the parking lot. 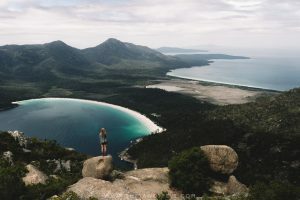 In search of the absolute best views of the famous Wineglass Bay and the hulking mass of the Freycinet Peninsula, we set off on the challenging but incredibly fun rocky scramble up Mount Amos. The hike only takes about an hour each way but is not one to be taken lightly requiring plenty of clambering up steep and slippy rocks and trying desperately not to overbalance backwards, scuttling up narrow crevices, hoisting yourself over boulders and grasping clumsily onto well-placed trees to stop from falling on your arse (or face). If you have some level of upper body strength and are feeling adventurous, it’s a really fun way to experience the area and enjoy the fantastic views on offer. Returning to the car, ravenous after the morning’s exercise, we wolfed down our lunch before setting off again, stopping in at the ridiculously crowded Wineglass Bay Lookout before jumping down the hundreds of stairs to the iconic bay itself for a daily dose of sea spray. If you’re not up to climbing Mt Amos but still want to explore the national park on foot, there are a number of other hikes such as the 5-hour Hazards Beach Circuit or the multi-day Peninsula Track. After a much-needed afternoon cup of tea back at our accommodation, we headed up to Cape Tourville and Sleepy Bay in the hopes of catching the sunset across the peninsula. Instead, it was grey skies and tempestuous seas that wrapped around the rocky cliffs which was, in some ways, even more dramatic. The short boardwalk at Cape Tourville offers up some pretty views and if the weather is clear you can expect a brilliant show as the fading light plunges between the folds of the mountains. On the recommendation of the friendly staff at the Visitor Centre, we moved on to Sleepy Bay, and while the vibrant orange rocks and peaceful cove were quite lovely, they were slightly overshadowed by the gloomy weather and swarms of mosquitos. With aching legs from the previous day’s adventure and not too much of a drive on the day ahead, a bit of a lie in was definitely in order, followed by a much-needed and completely delicious brunch at Artifakt Cafe in Swansea, a cosy spot on the main road with an art gallery out the back, before pushing on to Hobart. If you can, try to coincide your visit with a Friday and Saturday when the city’s markets burst to life. After checking into our hotel, the first stop on our agenda was a very windy Mount Wellington to enjoy the full panorama over the city and its beautiful coastline. The conditions tend to be a little wild up here so don’t forget to bring a jacket, even if it’s mid-summer. Then it was time to hit the Hobart institution Street Eats @Franko, a bustling street food market set in Franklin Square where you can find everything from vegan tacos and bao buns to seafood platters and mouth-watering curries, and enjoy the live music on offer. The market runs between 4 and 9 p.m. on Fridays and food does sell out so it’s best to arrive earlier rather than later so you don’t miss out. Depending on the time of year, it may make more sense to eat here first and then head up Mount Wellington for sunset rather than the other way around. Hobart has a wide range of accommodation to suit any budget. Aside from Mount Wellington, the city’s main attractions are all within easy walking distance so I’d suggest staying somewhere near the centre so you can ditch the car and explore on foot instead. Many streets have metered parking during the day which can be somewhat problematic, but if you’re visiting over the weekend, you’ll find a number of options for free parking. Check rates and availability in Hobart here. If you’re here on a Saturday, start the day at the Salamanca Markets before jumping on the ferry to the infamous Museum of Old and New Art, or MONA. Whether you’re an art enthusiast or not, you simply can’t leave Hobart without paying this place a visit. Home to Australia’s largest private collection of art by David Walsh, many pieces are interactive, immersive and truly critique and push the boundaries of the modern art realm. Most notably controversial are Cloaca Professional, a mechanical digestive system that eats, farts and poops on schedule, Cunts… and other conversations, a series of plastered female genitalia, and Tim, a living, breathing and heavily tattooed man who is himself the artwork and sits in silence in the gallery on and off throughout the year. Controversy aside, it’s easy to lose hours wandering the enormous chambers that are a world away from the stuffy galleries you may be used to. The space is devoid of wall texts, replaced instead by ‘The O’, a hand-held device that guides you between the pieces providing context, insightful commentary and amusing tidbits from the curators. A ferry trip to MONA on one of the camouflaged catamarans, MR-l and MR-ll, is often said to be the perfect bookend to this overwhelmingly original experience, and while cruising up the River Derwent is a lovely way to reach the island, at $22 each, if you’re on a very tight budget I’d say you’re not missing out on a great deal by simply driving yourself. It’s possible to park for free, but be sure to arrive early as spaces are limited. Spend the final hours of the afternoon amongst the pretty pastel streets and parks around Battery Point before moseying back down to the waterfront for a seafood dinner and evening stroll around the picturesque marina area. With a long day of driving ahead, we set off relatively early, though with a number of roadworks to navigate and several stretches of narrow winding roads that seriously hampered our progress, it took us the better part of the day to reach Cradle Mountain and was certainly far longer than the 4 hours suggested by Google Maps. Luckily there are several lovely places to stop along the way to break up the trip. There are three possible ways to drive between Hobart and Cradle Mountain depending on how much time you’ve got. Fastest is along the A1 via Campbell Town where you’ll find the town’s famous red bridge and fascinating Convict Brick Trail which is dedicated to the nearly 200,000 convicts sent to Australia between 1788 and 1868 and details the crimes for which they were convicted. There’s also a large bakery with a well-stocked oven of freshly made pies which makes a decent lunch stop. Taking more or less the same amount of time is the A4 through the Central Highlands which weaves between a series of lakes but doesn’t provide much opportunity to stop along the way. Sealy’s Cafe in the historic town of Bothwell makes a lovely, if rather expensive, place for a morning coffee break. The longest but perhaps most spectacular route is via the A10 which skirts around the back of Cradle Mountain-Lake St Clair National Park through the remote and beautiful backcountry. On this route, you might consider breaking up the trip with the 3-hour hike to Montezuma Falls which leads you across a suspension bridge and through lush rainforests to one of Tasmania’s highest waterfalls. The first two routes converge in Deloraine which has a huge supermarket where we stopped to pick up food for the rest of the week and stock up on hiking essentials. Don’t miss the nearby Christmas Hill Raspberry Farm for all manner of delicious raspberry treats – think smoothies, pancakes and scones with homemade jam. The perfect place to refuel before the final leg of the drive. Keep an eye out for the huge murals as you pass through Sheffield before hitting the winding mountain road that funnels you toward Cradle Mountain National Park. Despite the speed limit indicating 100km/h, this stretch is a series of tight hairpin bends and narrow roads that call for much more care. As you near the national park, be especially cautious of wildlife on the road. 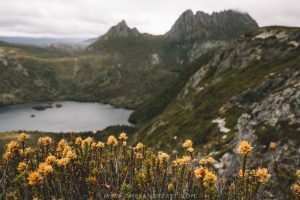 We arrived at Cradle Mountain shortly before dusk and set off along the short but impossibly wonderful Enchanted Walk followed by an evening drive into the park to catch our first glimpse of Dove Lake. Within minutes we had spotted a platypus, wombat, pademelon and an echidna – a theme that would repeat itself much to our delight in the days to come. While the mountains were shrouded with thick clouds and a light drizzle filled the air, there was certainly a touch of magic to the place. 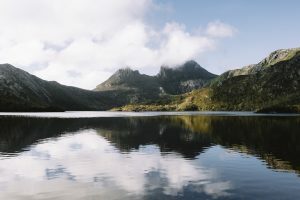 Cradle Mountain National Park is a veritable hiking paradise, whether you’re after a short afternoon stroll or a challenging all-day adventure. In fact, it’s far too easy to lose hours moseying from one spectacular boardwalk to the next, tracing the curves of this pristine bushland, clambering up to jaw-dropping viewpoints and wandering between ancient forests and blushing meadows where Australian fauna are abundant and every landscape like a scene from Middle Earth. Greeted by gloomy skies and light rain we stuck to the lower trails, weaving our way around the Dove Lake Circuit, taking in the views from Marion’s Lookout and snapping pictures of the adorable wombats at Ronny’s Creek before following the beautiful boardwalk past Snake Hill all the way to the Visitor’s Centre with a short detour to see Pencil Pine Falls. Between the bushes blanketed in tiny white wattle flowers, the golden fields of buttongrass and the spindly grey forests, it was a full and wonderful day of hiking through the wilderness, closed off with a well deserved evening G&T in our cosy cabin. By the second day, the weather had deteriorated even further with low slung cloud, persistent rain and little visibility of the stunning views on offer. Still, we set off to explore, tackling Hanson’s Peak, the Face Track which runs beneath Cradle Mountain Summit, the Horse Track and back down to Ronny’s Peak. We had hoped to attempt the summit on this day but with the final stretch consisting of an intense rocky scramble with sheer dropoffs, heavy rain and zero visibility was hardly the best conditions for it. If you’re lucky enough to get a clear weather window, don’t miss the opportunity to explore the higher trails that offer up stunning views over the lakes and peaks while you can. By the afternoon the weather had cleared casting brilliant glimmering gold across the landscapes and so we set off for one final hike, the Dove Canyon walk. While still beautiful, it wasn’t quite as impressive or well-maintained as the other trails. After two fantastic days in Cradle Mountain National Park marred by some truly dreary weather, the final morning brought clear skies and a radiant sunrise over Dove Lake that was well worth the early wake up. Onward to Launceston, there’s not all that much to see en route, though if you happened to miss Christmas Hill on your way up, this is a perfect time to rectify the situation. Feeling decidedly lazy after a few jam-packed days of hiking, we whiled away the afternoon at Cataract Gorge just outside of town, lounging on the grass and paddling about the lake. It’s a popular hangout spot with a constant rotation of people between the public barbecues and plenty of short walking trails to better explore the area on foot. Launceston has much more of a small-town feel than Hobart with plenty of accommodation options to be found in the centre. Check rates and availability for Launceston here. Tamar Valley first landed on my radar a few years ago when I bought a tub of their yoghurt from a supermarket in Sydney and after one delectably creamy scoop was convinced it was the best I’d ever tasted. Stretching north from Launceston towards the coast, the lush banks of the Tamar River play host to some of Tasmania’s most fertile farmlands, but today we would be focussing on just one of its famous products – the wine. A short stroll through the Tamar Island Wetlands and a morning tea break at Brady’s Lookout to admire the sweeping valley views and it was time for our first wine stop of the day at Goaty Hill Wines. With an absolutely beautiful setting beneath the trees, a friendly bunch of staff and a very generous and affordable tasting menu, this is one the best (and not at all pretentious) wineries to visit in the area. The wine is absolutely delicious as well so you’ll be clamouring to buy a bottle or two following your visit. With the day seriously getting away from us by this point, we cast off the wine-induced afternoon stupour and made a beeline for the windswept Low Head Lighthouse in the hopes of laying eyes on the resident penguins before squeezing in just one more wine tasting at Pipers Brook with its sweeping vineyards and rolling hills before returning to the city. With a day full of wine behind us, it was time to switch things up with a visit to the very low-key Red Brick Road Ciderhouse which serves up paddles of five cider samplers and allows BYO snacks, before wandering over to Alchemy Bar for a final dinner in Tasmania. You can fly direct to Tasmania from Sydney, Melbourne or Brisbane, landing in either Launceston or Hobart. If you’re flexible with your dates and planning well ahead, keep an eye out for sale fares on Australia’s low-cost carriers which regularly have deals for less than $50 each way. Search flight deals for Tasmania here. Otherwise, as I recently discovered, it’s also possible to take the Spirit Of Tasmania Ferry between Melbourne and Devonport. Crossings are not particularly cheap, but if you’re travelling with a vehicle that will act as both transport and accommodation during your visit and you’ll be staying in Tasmania for a few weeks, this may be the more economical option. Compare ferry prices here and here. Prices for car rental in Tasmania can vary wildly so be sure to check out a few operators to find the best deal. I usually do an initial price comparison on rentalcars.com before going directly through the car rental operator, however, for Tasmania we managed to find a car for around half the price on the annoyingly similarly named carrentals.com and so decided to book directly through that platform instead. As I understand it, they book their cars in bulk before allocating them to customers which leads to prices being significantly cheaper. In the end, we booked with Europcar through this platform and then bought additional car insurance directly with Europcar on arrival. Compare prices through rentalcars.com and carrentals.com. Tasmania has some truly beautiful places to stay, though in many areas, especially around the national parks, options can be fairly limited. In fact, in our actual itinerary, we were forced to make a beeline up to Cradle Mountain from Freycinet and then return to Hobart later on as these were the only days that we managed to find the accommodation we wanted in the national park and had to rearrange our plans accordingly. Given how limited accommodation is in some parts of the state, it’s definitely a good idea to lock your accommodation in well in advance, especially if you’re travelling in peak season. Start searching for your Tasmania accommodation here. Any good road trip needs a good soundtrack and after quickly tiring of the radio we chose an audiobook to listen to for the rest of the trip. I subscribe to Audible on and off throughout the year to receive audiobooks when I need them. New to the platform? Get two complimentary audiobooks when you sign up for the 30-Day Audible Free Trial . It’s easy to cancel any time (which I often do between books) so once you’ve got your free books, there’s absolutely no obligation to stay if you choose not to.